You could insert that word between just about any scene in Noah Baumbach's new dramedy, Greenberg. This movie is one big pile of awkward. It's a portrait in discomfort, framed in self-pity and disappointment. And I kind of loved it. 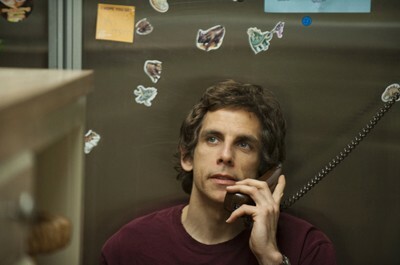 The movie stars Ben Stiller as Roger Greenberg, a native Los Angelino who vacated to New York in his 20s and now returns as a 40-year-old man, fresh out of a stay in a mental hospital and crashing at his brother's pad while said brother is opening up a hotel in Vietnam. Roger is a carpenter, so he builds things for a living, but his brother Builds Things. That's why the brother has a wife, a dog, and children and lives in a house with a pool. His life has momentum, while Roger's doesn't. But, he's going to build the dog a doghouse, and that's something, right? Roger would have you believe he's better, but he's really just a mess. He says time and again that he's busy doing nothing on purpose, but he's got a lot of nervous energy to expend. He tries to reconnect with his old bandmates, one who hasn't forgiven him for queering their record deal fifteen years ago (he's played by indie darling Mark Duplass), and the other who is willing to give it a try but who has trouble traversing the rift (he's Rhys Ifans). The problem is, they've matured, and Roger hasn't. Ivan, the friend who likes him, has a wife and kid, and though he's also got marital problems, those are at least the problems of a grown-up. Perhaps it's Roger's aimless arrested development that causes him and his brother's personal assistant, a kind but dopey girl named Florence (Greta Gerwig, who was in Duplass' Baghead), to be irresistibly attracted to each other. From their first meeting, there is a fumbling flirtation between them. Florence is kind of shy and gawky and generally sweet. The dark, self-absorbed neurotic is a pretty bad fit for her. Every encounter ends on a sour note, and they swear to stay away from each other, which is a promise that lasts only until Roger needs a ride somewhere and has to call Florence to drive him. For all the growing up he won't do, Roger is also kind of like a cranky old man, endlessly writing letters to companies and organizations that piss him off. He thinks he has all the life knowledge and knows what's wrong with everyone else, while only having a tenuous grasp on why his own life isn't working. When Ivan tells Roger that other people say he doesn't have much of a sense of humor about himself, watch out! You don't call that particular kettle black. Writer/director Noah Baumbach--working here from a story he cooked up with his wife, actress Jennifer Jason Leigh, who also appears as Roger's ex-girlfriend--has made a career out of satirizing the hang-ups of intellectuals. His 1995 debut Kicking and Screaming chronicled a group of friends preparing to leave college, convinced they knew better than everyone else and would soon have the world wired for their particular sound. Naturally, Baumbach spent the film cutting each and every one of those wires, forcing his characters to reassess. They would enter the adult world, even if they had to be dragged, as the saying goes, kicking and screaming. Greenberg could almost have been subtitled Still Kicking and Screaming. Roger is one of those college boys suddenly finding himself on the precipice of middle age. In a moment of really getting real, Roger confesses that his life is not what he wanted it to be. Why would he choose to be isolated and misanthropic? Greenberg is the story of a man who never wanted to get old, refuses to really face that he has, and so he's just stopped. Kids these days are scary, but the adults aren't so hot either. It's tough to get better and get along when everyone around you is so annoying. When his older friends party, they do it with their kids; when Roger goes to a younger party, they are kids. The funny thing is, for as much as you hate him, it's hard not to root for Roger to get it together. Even if it is just so he'll be nicer to poor Florence. Gerwig plays the girl with an appealing honesty that she delivers with an endearing ineptness. This is a girl who makes her living doing someone else's menial tasks, but she's surprisingly demanding when it comes to Roger. Baumbach is kind of teasing around the cliché of the magical pixie girl, but Florence doesn't quite fit. Roger tries to project hang-ups onto her, but she doesn't take them on, she's not broken enough to be his spritely salvation. Not that her life isn't its own mess, it's that there's no need for Roger to fix it. If she's looking for anything, it's a haven to be happy. If it seems like I'm grasping around here, searching for a thread of criticism to latch onto, it's because Greenberg is a strange movie. It's full of ideas and characters who are on a permanent tilt. Baumbach isn't employing a conventional structure. Greenberg is, in a way, an anxiety-addled romantic comedy, but it doesn't have the strict up-down-up throughline that rom-coms have. The style of the film is pure indie, though more Cassavetes than mumblecore. The sets are under decorated, the shots simplified. The script is droll, and Baumbach is as much in love with his characters as he is aware of how deluded they can be. Like he was with the father figure he created in The Squid and the Whale, the writer/director is fascinated by the ways a guy like Roger puffs himself up, and though he laughs at him when the balloon pops, Baumbach also sympathizes. He's heckling Roger even as he gives him a hug. The wit is so dry I hesitate to label this one a comedy, yet the emotions are so in check, it's not melodrama either. Greenberg is in a middle ground that is pure Baumbach. This movie is to mid-life crises what the Coen Bros.' Barton Fink was to writer's block. 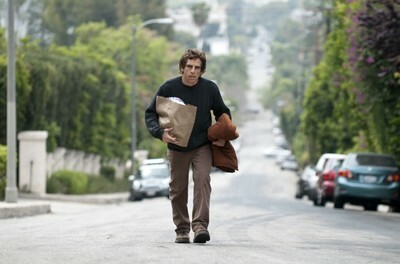 Ben Stiller has dialed it down for Greenberg, and it's a great performance from him. He makes Roger that sad clown that haunts so many bad paintings, a basically likable guy that, again, doesn't understand why people don't see how funny he is. The frown is painted on, there's nothing he can do. It's a variation on his Royal Tenenbaums character, except Chas is depressed because he took some risks and they didn't pay off; Roger is depressed because he's never really risked at all. I hate to admit, but part of why I am so beguiled by this performance and by this movie, is that I am Roger. No, not to the extreme of him, but I am at that stage of life he is at, and there are smart little touches throughout Greenberg that show how insightful Baumbach is. The times when Florence obliviously refers to someone younger than Roger as old, the realization that she doesn't know about the things that mattered to him when he was her age, his wondering how he got from there to here and if this is even the right here to be in--some of it struck really close to home, and I'm desperately hoping it's more universal than I think. I know. I've said too much. Awkwaaard. Buy tickets to "Greenberg" now!